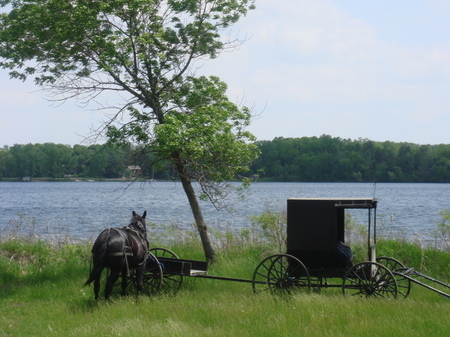 There are a number of Amish families living in this area. 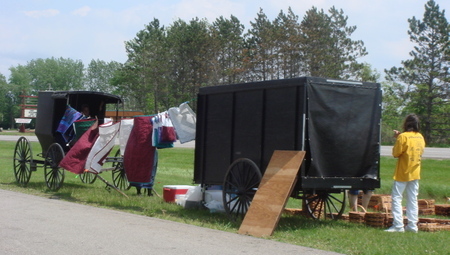 Each summer several of the women (and occasionally the young girls) bring two buggies down to the main road, string a line between the buggies and display their quilts. They are made from bright polyester fabric however, I have seen some made from cotton. Of course, you are not allowed to take photos, so I’m careful not to include the women in the photo and only took it from the back. rules set down by the Elders of the group, but are always friendly and warm and it has been our pleasure to visit with them. Next PostTattoo the jacket.!!! – finished, an $8 wonder….